This is something I have needed. Until now I just had one pair so often the one pair were in the wash and I had to make due without a pair while doing yoga. These are great and keep me from slipping during exercise. I feel stable while doing poses. There are 4 colors with anti-slip bottoms. They are comfortable and stay put while providing just the right amount of support. These come up to your ankle area and are not no show socks. These are also great for using when you go to places that have jumpy house, or in our case trampoline parks. They give that extra security of not slipping. 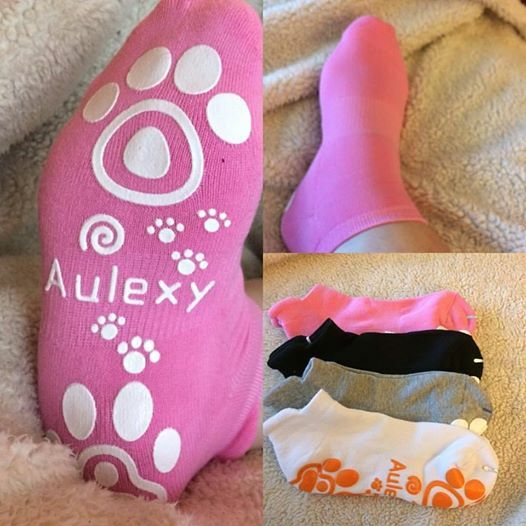 The #Aulexy anti-slip socks can be found at my affiliate link below. Note it says 5 pairs for some reason but you only get 4 pair. Not sure why it is stated like that. What Aulexy has to say about their product. - PERFECT FOR YOGA, PILATES, BARRE, INDOOR AND OUTDOOR PRACTICE. PVC grip dots cover the entire foot for a safe and secure step during any workout. Heel tab design prevents sock from sliding down the heel when worn with shoes. Tired of slipping when practicing yoga? It is the Secret of Never Worrying about Losing Grip! - SUPREME QUALITY WITH COMFORT AND BREATHABLE. These nonskid socks are soft, breathable and extremely durable. No more holes, shrinking or shedding! Natural cotton absorbs sweat, gives you ultimate comfort with less bulk and offers you barefoot feeling. - FAIRLY ELASTIC AND GRIP LIKE A PRO. Engineered anti-slip grips on the heel and arch offer superior balance, comfort and stability, which helps you hold your poses with ease during yoga practice. Elastic material comfortably stretches over your foot for a snug and secure fit that won't twist or slide with use. - PREVENT INFECTION: Bare feet combined with shared mats make you vulnerable to fungal infections. Regular socks are less breathable and less absorbent, which leads to infection. Investing in our socks now to avoid pain down the road. - ALL PURPOSES IN ONE. Ideal for not only yoga, but also pilates, barre, bikram and ballet dance. Perfect for home, travel, studio and hospital use too. Specifically designed for Yoga and Pilates, it offers superb grip and traction on almost any surface, which results in better balance, stability and control during workout sessions. Disclosure: MarksvilleandMe received one or more of the products mentioned above as part of a promotion with Tomoson and Aulexy. Regardless, MarksvilleandMe only recommends products or services we use personally and believe will be good for our readers. Some of the links in the article may be “affiliate links.” This means if you click on the link and purchase the item, I will receive compensation. If you would like MarksvilleandMe to review a product or service please contact us at marksvilleandme@gmail.com.